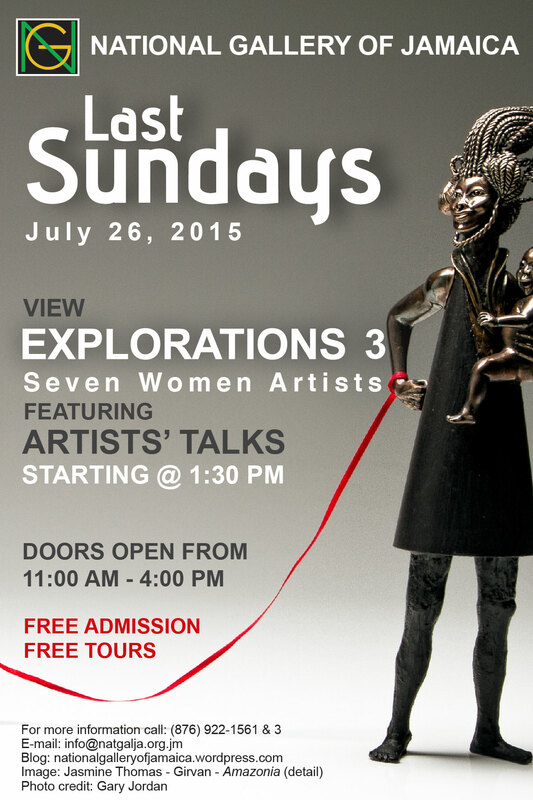 The National Gallery of Jamaica’s Last Sundays programme for July 26, 2015 will feature the much-anticipated artists’ talks to accompany its current exhibition Explorations 3: Seven Women Artists, which invites viewers to reflect on the role and status of women in the Jamaican art world. Participating artists will include Miriam Hinds-Smith, Amy Laskin, Prudence Lovell and Berette Macaulay, who will speak about their work and the issues that surround it, in the context of local and global debates about the role and advancement of female artists in the art world. Visitors will not only be able to view the Explorations 3: Seven Women Artists exhibition but also the Kapo and Edna Manley Galleries, the Historical Galleries, and the A.D. Scott Galleries, as well as a temporary exhibition consisting of sections from the Gallery’s modern Jamaican collection, which is staged while those galleries are being refurbished. 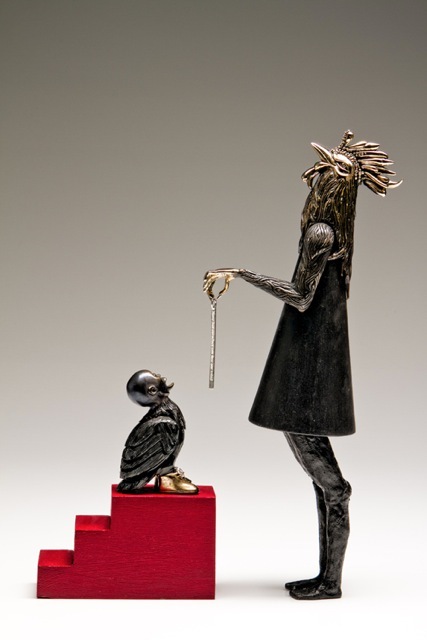 The latter exhibition includes major work by Edna Manley, Albert Huie, Carl Abrahams, Koren der Harootian, David Pottinger, Barrington Watson, Eugene Hyde, Mallica “Kapo” Reynolds, Everald Brown, Albert Artwell, Colin Garland, and Gloria Escoffery. As is customary on Last Sundays, the doors will be open to the public from 11 am to 4 pm and admission, guided tours and children’s activities will be free. Contributions to our donations box are greatly appreciated and help to fund exhibitions and programmes such as the Explorations series and our Last Sundays programming. The gift and coffee shop will also be open for business. 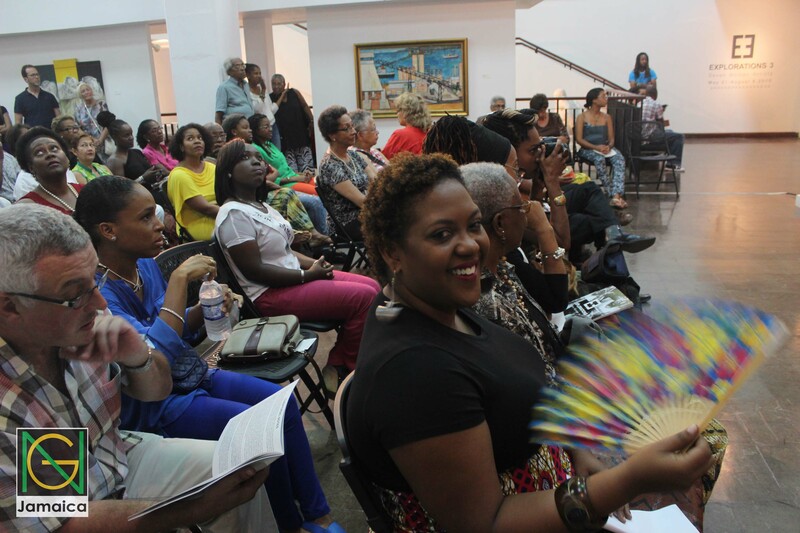 The National Gallery of Jamaica’s Last Sundays programme for June 28, 2015, is staged in association with the 2015 Kingston on the Edge (KOTE) urban art festival. 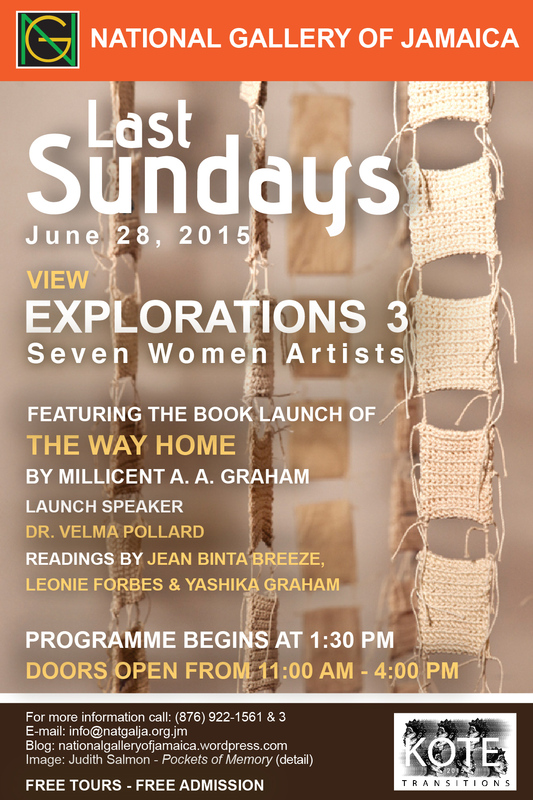 The programme will feature special tours of the Explorations 3: Seven Women Artists exhibition and the launch of the poetry collection The Way Home by Millicent A.A. Graham. 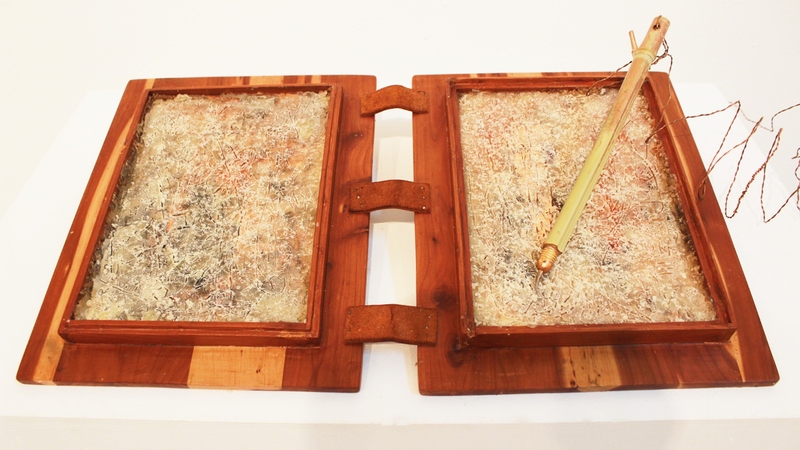 Explorations 3: Seven Women Artists, which opened on May 31 and continues until August 8, is the third edition of a series of exhibitions that explore the big themes and issues in Jamaican art. It asks whether any concept of women’s art is relevant in Jamaica today and features work by Kereina Chang Fatt, Miriam Hinds-Smith, Berette Macaulay, Amy Laskin, Prudence Lovell, Judith Salmon, and Jasmine Thomas-Girvan. 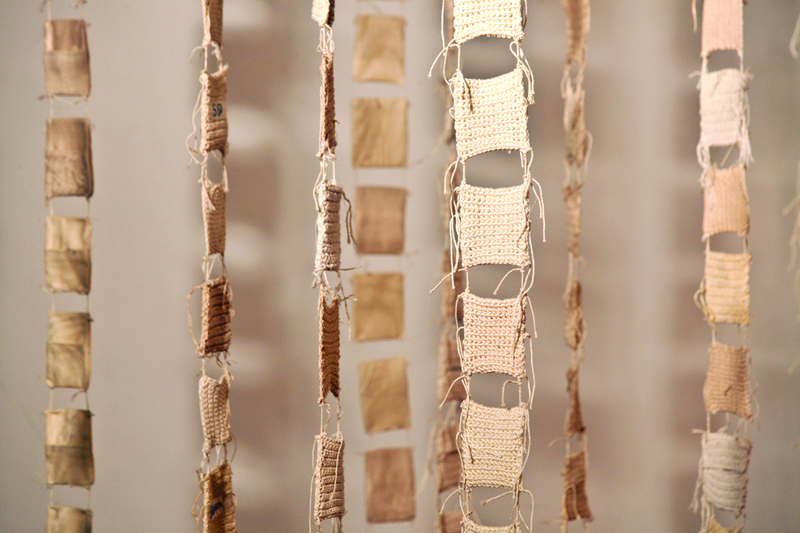 Explorations 3 was curated by National Gallery Senior Curator O”Neil Lawrence. The Way Home is Millicent A.A. Graham’s second poetry collection and is published by Peepal Tree Press; her first collection, The Damp in Things, was published in 2009, also by Peepal Tree Press. Graham is a fellow of the University of Iowa’s International Writing Program, 2009 and was awarded the Michael and Marylee Fairbanks International Fellowship to Bread Loaf Writer’s Conference, 2010. 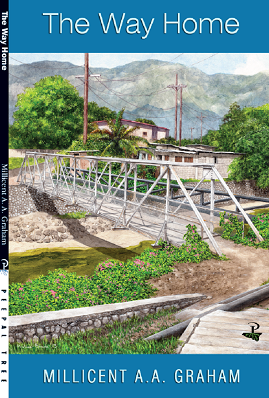 The Way Home will be introduced by the critically acclaimed poet and novelist Velma Pollard, who is a retired senior lecturer and former Dean of the Faculty of Education, UWI Mona. This will be followed by readings from the poetry collection by the first lady of Jamaican theatre Leonie Forbes, by fellow poets Jean Binta Breeze and Yashika Graham and by Millicent Graham herself. Admission and guided tours on Sunday, June 28, 2015 are free but donations are gratefully accepted. The doors will be open from 11 am to 4 pm but the book launch will start at 1:30 pm. The National Gallery gift and coffee shop will be open. If my grandmother saw her children looking untidy she would say, “How you look like you a live bad a man yard so.” The aim of my talk this afternoon is to reclaim my grandmother’s phrase and apply it to the Jamaican art scene where Jamaica is the man’s yard and female artists through the simple act of creating art are being bad. However, I perceive this badness as a good thing: a subversive act of rebellion. My grandmother used the phrase to imply that her daughters looked as if they were being ill-treated by a man. One could argue that the phrase is a metaphor for how patriarchal strictures in our society still prevent female artists from gaining the maximum benefits that could be derived from their artistic output. I want to make it clear that I am not talking today as an art critic. I leave that to the experts like Veerle and O’Neil. I’m a poet and poetry is art; therefore, I am talking about my journey as a female artist. From that viewpoint, I will also address the term “women’s art” or “female art” and how I think the category assists and restricts the work that we do as female artists. One could argue that his sentiment was fuelled by chauvinism and stereotypical ideas of femininity. However, the truth of the matter is that many great female artists have had to deal with the burden of creating art while fulfilling society’s role of the “real woman”; especially in our Jamaican context, where I would argue that art is still not perceived as a viable occupation and though we have many women in managerial positions, women are still judged by their ability to master the traditional roles of wife, mother and housekeeper. As an aside, I will give you a joke, I went to the mineral bath in St Thomas a few years ago and one of the informal masseurs, while massaging me, asked if I had children and when I said no, my good-good therapeutic massage turned into a blessing and a “balming” for my poor, barren womb. Up to when I was getting into my car, this man was still reaching through the window to touch my belly and chant a few Psalms for my womb. Born in Sierra Leone, Berette Macaulay grew up in Jamaica while also spending considerable time in the UK. She obtained her BA degree in Theatre from Marymount Manhattan College, New York, and now lives and works in New York. The search for personal identity, selfhood and belonging is at the heart of the photography and multimedia work of BeretteMacaulay. She not only explores traditional analogue and digital photography but also uses various experimental techniques, such as Polaroid image transfers and chemical manipulation. 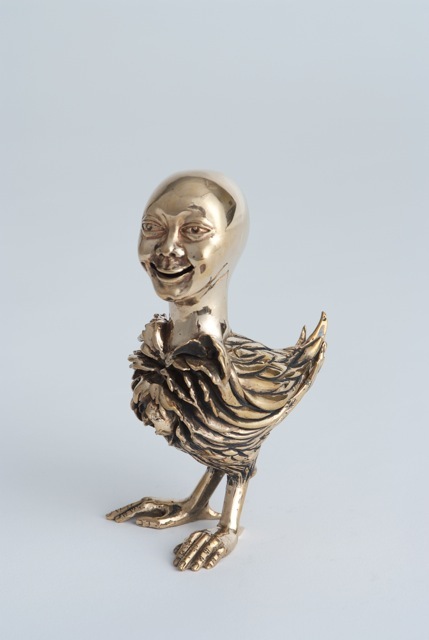 Using these techniques, Macaulay has produced several seemingly divergent bodies of work, such as the CrowDED, Neue Rootz and, most recently, the ongoing ReKONstruction: Differentiated Possibility series. 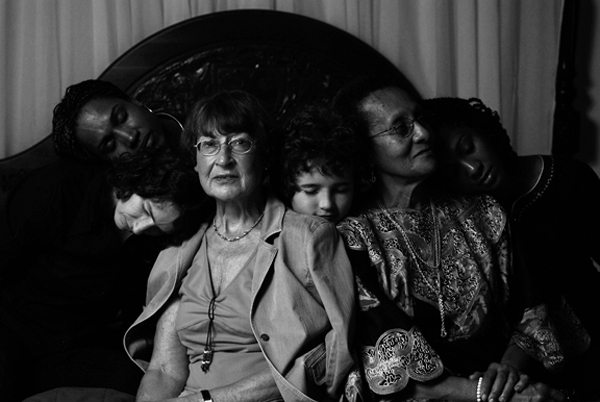 The haunting, turbulent images in CrowDed speak to overcoming personal trauma; the drive to resolve those histories and its relationship to the construction, reconstruction and establishment of family ties is seen in her Neue Rootz series, which explore her family’s African, Central European and Caribbean connections. 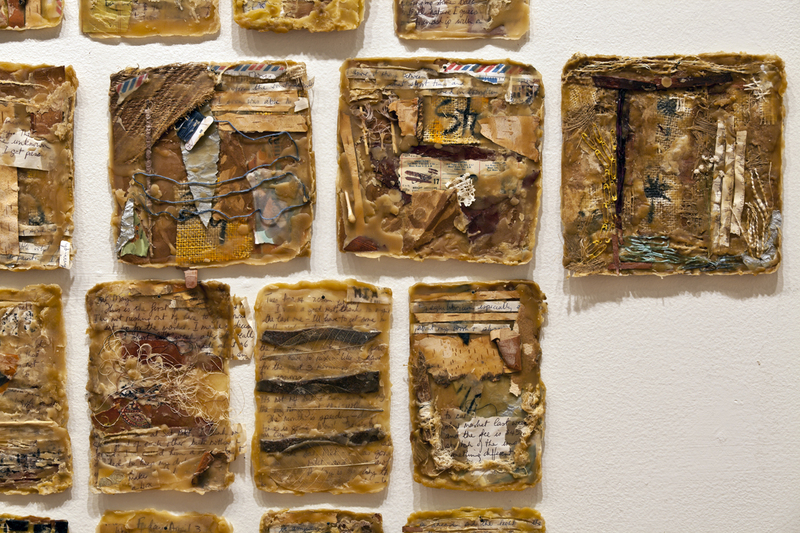 Her most recent series, ReKONstruction, in turn, embodies her preoccupation with mythology and the power of memory, to speak about evolution and personal growth. 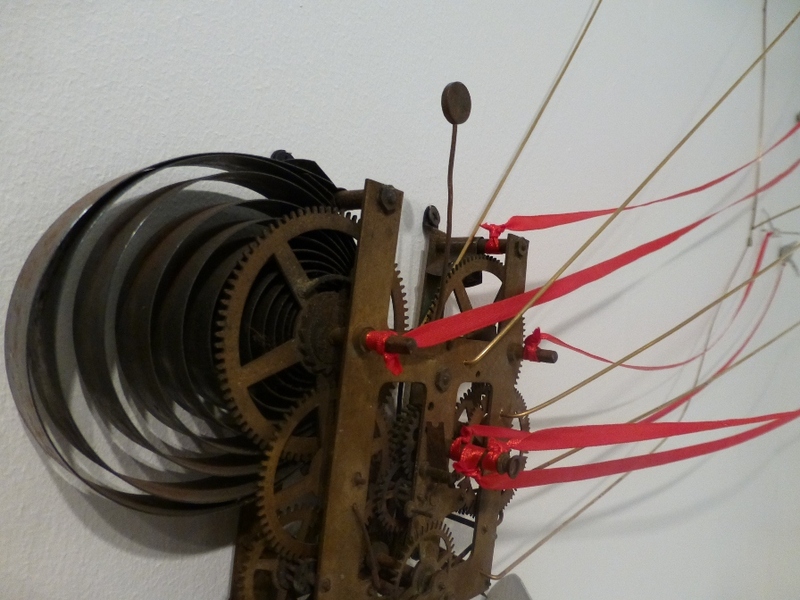 While the work may seem divergent, there is an inner logic that pulls it all together into a complex exploratory narrative about personal history and resolution.